More than 12 million American’s suffer from dry macular degeneration. This is an eye disease in which the retina deteriorates from the formation of small yellow deposits known as drusen. This leads to drying out of the macula causing it to lose its function. While many with dry macular degeneration may have good central vision, they may have limitations and difficulty with reading, limited vision at night and loss of vision may still occur. Macular degeneration tends to progress slowly in time. This is a common problem for people over the age of 50 years old. Recently, researcher’s at the University of Florida have found what they believe is a promising treatment to limit inflammation that leads to macular degeneration. The researcher’s used an adeno-viral vector (AVV) to deliver an inflammation blocking protein into the eye. The protein comes from a myxoma virus that is normally found in rabbits found in parts of Europe in Australia. This gene inhibits the body’s immune response that causes inflammation that leads to eye disease. Researchers also found that this is effective in cases of uveitis which is an inflammation within the middle levels of the eye. 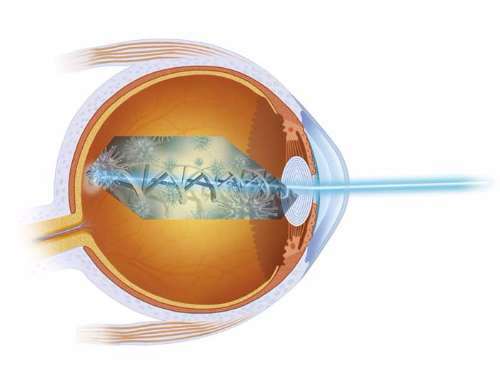 At present, there is no FDA approved treatment for dry macular degeneration. Some of the published recommendations to manage symptoms of macular degeneration include the use of over-the-counter supplements, specific foods which are rich and antioxidants, the use of Lutein, smoking cessation, controlling hypertension, and the use of blue blocker sunglasses. Uveitis has typically been treated with long-term use of steroids. This does increase risks of developing glaucoma. This new potential treatment may last a lifetime and only requires a single treatment based on current research. Adeno-associated virus vectors may prove to be the next-generation of treatments for many chronic diseases as they were able to deliver anti-inflammatory genes to diseased and damage parts of the body. Further research is planned after these recent results in a mouse model were published. The study from the University of Florida was funded by grants from the National Eye Institute, and National Institute of Allergy and Infectious disease, The Macula Vision Research Foundation and the Florida Biomedical Research Foundation. IIdefonso CJ, Jaime H, Rahman MM, Li Q, Boye SE, Hauswirth WW, Lucas AR, McFadden G, Lewin AS. Gene delivery of a viral anti-inflammatory protein to combat ocular inflammation. Human Gene Therapy. 2015 Jan; 26(1):59-68.